Copyright 2019 New England Real Estate Network, Inc. All rights reserved. This information is deemed reliable, but not guaranteed. The data relating to real estate displayed on this web site comes in part from the IDX Program of NEREN. The information being provided is for consumers’ personal, non-commercial use and may not be used for any purpose other than to identify prospective properties consumers may be interested in purchasing. Data last updated . Karin was everything you hope your realtor would be. She was incredibly engaged at every step of the process, but most importantly, she REALLY knows her stuff; you never get the feeling that she is doing this for anyone but you, and her effectiveness and competence is really apparent. She sold our home after one open house, but was so smart in coaching us to accept the offer that we did, for lots of solid reasons. She handled EVERYTHING. We sold so quickly that we didn't want to rush into a new home, so Karin hustled in our new town and lined up rental properties, and visited them with us! You get the impression that she is literally not happy unless you're happy, and the project is finished - the last action of which was buying gift cards to local merchants for everyone in my family in our new town! Stop looking, hire Karin! 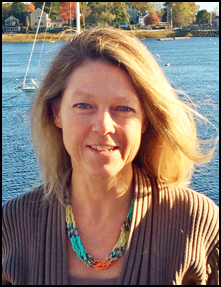 I highly recommend Karin Martin to anyone looking to buy a home in the Newburyport area. I was new to Newburyport and Karin answered the call to show me some properties. She came prepared and I immediately felt a trust and confidence in her that lasted throughout my search and buying process. She is a good listener, provides good counsel and is truly interested in finding the right home for you. She is knowledgeable about the surrounding area, the neighborhoods and was thorough in answering any and all questions. She helped me navigate the whole process from search to closing. I never felt pressured to make a decision and I knew she always had my best interests at heart. I would highly recommend Karin to anyone looking to buy or sell a home in Newburyport! Karin was great , super efficient and honest. Karin was very accessible and responsive. She helped me stage the house and it looked better than I ever imagined. She managed the whole process with the utmost of caring and compassion. We had a simultaneous closing, not common, and the lawyers were very impressed with Karins attention to detail. I would highly recommend her to anyone. My husband Mike and I have found Karin to be a pleasure to work with as our real estate agent. Last summer we decided to sell our home in Amesbury. Karin helped us prepare our home for the sale, making suggestions on improvements that would make our home show well and tips on how to stage it for the open house. With her knowledge of the local markets she helped us to price our home appropriately and at our first Open House we received two offers at asking price and we had a contracted sale the following week. Karin was key in making this happen! We are also working with Karin to find a new home in the area. Being from the area, Karin knows the neighborhoods, their history and has a solid sense of the value each home brings. She has been patient with us and is always positive and optimistic! I am sure with her help we ( and you) will find our dream home.